ISLAMABAD, Mar 23 (APP):Malaysian Prime Minister Dr Mahathir Mohamad left for his homeland on Saturday on the conclusion of his three-day official visit to Pakistan. Prime Minister Imran Khan saw off the Malaysian leader at the Nur Khan Airbase. Foreign Minister Shah Mehmood Qureshi, Minister for Planning Makhdoom Khurso Balhtiar and other senior officers were also present. Before the departure, the Malaysian Prime Minister was given a briefing about the light weight, all weather and multi-role JF-17 Thunder fighter aircraft. He evinced keen interest in its various qualities. 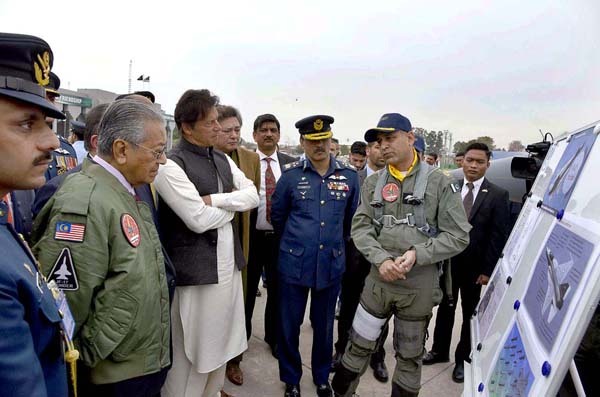 Dr Mahathir Mohamad, who was presented with a flying jacket on the occasion, also inspected the cockpit of a JF-17 Thunder and was briefed about its technical details by the officers of Pakistan Air Force. Malaysia along with some other countries has shown their interest in procuring the JF-17 aircraft, jointly developed by Pakistan and China. The JF-17 Thunder, recently used by the PAF in a dog-fight with Indian jets, had proved its metal by shooting down two Indian fighter aircraft. During the visit of Malaysian Prime Minister undertaken on the invitation of Prime Minister Imran Khan, the two countries, besides discussing the prospects of enhanced trade and economic relations, also signed various memorandums of understanding (MoUs) and agreements for bilateral cooperation in diverse areas. Prime Minister Dr Mahathir Mohamad also attended the Pakistan Day Parade as the guest of honour, where besides other PAF fighter jets, the JF-17 Thunder also displayed its manoeuvring power, tactics and flying capabilities. Meanwhile, the Foreign Office, in a statement, said it had been a great honour for the people of Pakistan to have one of the most admired leaders of the Islamic world to celebrate with them the national day of Pakistan. The visit of Prime Minister Dr Mahathir Mohamad provided an opportunity to further cement and elevate strategic relationship between the two countries, it added. Dr Mahathir Mohamad, who during the visit was accompanied by a high-level delegation, including several leading businessmen, was accorded a ceremonial welcome at the Prime Minister House. Both the prime ministers held delegation level talks. In view of the growing momentum of bilateral cooperation, it was agreed to elevate the Pakistan-Malaysia relationship to a strategic partnership. Prime Minister Tun Dr Mahathir Mohamad stressed the need for converting friendship between the two counties into cooperation. Both the sides agreed that dialogue was the only way to ensure peace and stability in the region and to resolve outstanding issues. They expressed deep concern at the growing wave of Islamophobia and condemned the atrocities and human rights violations being committed against Muslims around the world. Prime Minister Imran Khan briefed Prime Minister Mahathir on the gross human rights violations in IOK (Indian Occupied Kashmir) and the importance of the resolution of the Jammu and Kashmir dispute in accordance with United Nations Security Council resolutions and wishes of the Kashmiri people. The two sides exchanged official notes regarding ratification of the Agreement on Partial Abolition of Visa Requirement for Diplomatic and Official Passport holders, recently signed between the two countries. The two prime ministers addressed a Round Table Business Forum, which was attended by a large number of Malaysian and Pakistani business leaders. Flagship Malaysian companies Proton and Edotco, in automobile and telecom sectors respectively, announced their investment agreements during the Business Forum. The two prime ministers witnessed the ground-breaking ceremony of Proton Automobile Industry in Pakistan and signing of three important agreements / MOUs between Edotco and Pakistan Mobile Telecommunication companies. Prime Minister Mahathir also called on President Dr Arif Alvi. The two leaders exchanged a wide range of views of mutual interest. The President of Pakistan conferred Pakistan’s highest civil award “Nishan-e-Pakistan” on Prime Minister Mahathir in recognition of his leadership role for the Islamic world and work towards strengthening Pakistan-Malaysia bilateral relations in all fields. President Alvi also hosted a state banquet for the visiting Prime Minister at the ‘Aiwan-e-Sadr’.Prime Minister Dr Mahathir Mohamad was the guest of honour at the Pakistan Day Parade (March 23).